In a country where protesters still regularly chant "death to America" and burn our flag during rallies, you might think that American muscle cars would be extremely unpopular. You'd be wrong! 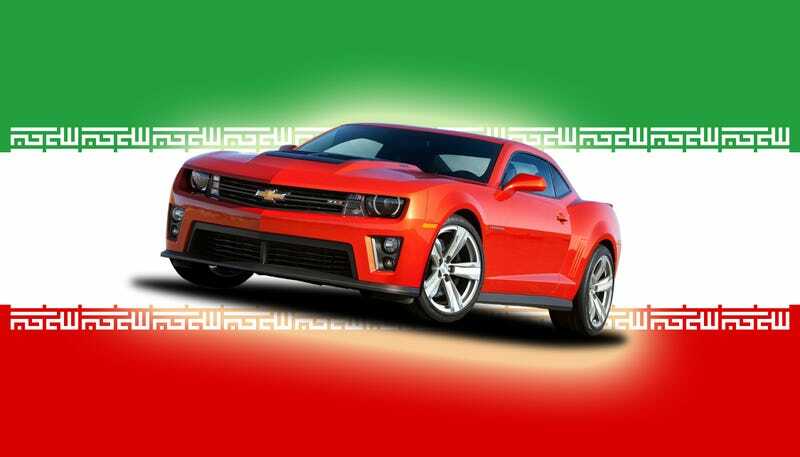 The Iranians can't get enough of the Chevy Camaro and its muscle-y brethren. Reuters reports on the surprising and growing popularity of American muscle cars in the Islamic Republic, which will be increasingly significant as both Iran's newer, more moderate-ish leaders and the West seem interested in thawing their relations and lessening trade sanctions. If that were to happen, American automakers would surely want a piece of the Iranian pie; this is a country with 75 million people and a considerable appetite for new cars thanks to decades of sanctions. The Reuters piece says that although American cars were quite popular in Iran prior to the revolution in 1979, they really haven't been seen much there in decades. But since last year, hundreds of new cars from America (and Europe) have appeared thanks to a nearby free trade zone in Aras close to Armenia and Azerbaijan. While the Islamic Republic bars imports of autos from the United States - which severed ties in 1980 after its diplomats were taken hostage - Aras benefits from exemptions allowing imports of vehicles from third countries with little or no tax. Businesses contacted by Reuters say more than 1,500 have been sold in Aras since the first half of 2012. More than half of those are American brands - including Chevrolet, GMC, Cadillac, Ford and Dodge. "I have four Chevrolet Camaros at the moment - they're seriously popular. But my most expensive car now is an Audi Q7, for $74,000," said (car sales manager) Mohammad. Iranians at the moment can only get temporary license plates to drive their Aras-bought American cars in the rest of the country for two months a year. But seeing those Camaros, for example, on the streets builds considerable amounts of hype for Chevrolet. One Aras seller took out Camaro advertisements with the slogan "the return of a legend after 34 years." Clearly, there's a demand for American cars just waiting to be tapped, and that's something GM may in fact be working on. As TTAC reported this year, French newspaper Le Figaro claimed GM officials have been working on a deal to get a foothold into the Iranian market should the sanctions be lifted; GM has denied this. At any rate, Iranians in Camaros may not be as outrageous as it initially sounds.